This is the laundry line we created after our “Wet Towels And A Rattlesnake” adventure. Drill bits, screws, cable cutters, sturdy deck posts! 1. Our plan was to have 3 lines at 4” apart for air circulation, so we needed to drill extra holes into the shelf bracket. 3. Install the eye bolts with one nut above and one below the bracket. Tighten so all eyes face the same direction. 4. Make a loop through the first eye bolt using the cable clamp to secure it. 6. Make the final loop through the closed end of the turnbuckle. 7. Hook the turnbuckle onto the final eye bolt and use the 2nd cable clamp to secure it. (We didn’t do that at first but we will be making that adjustment to what you see in the picture above). 8. Tighten the turnbuckle as required to make the line taught. As the line stretches, you can use the turnbuckle to make adjustments to the tension. 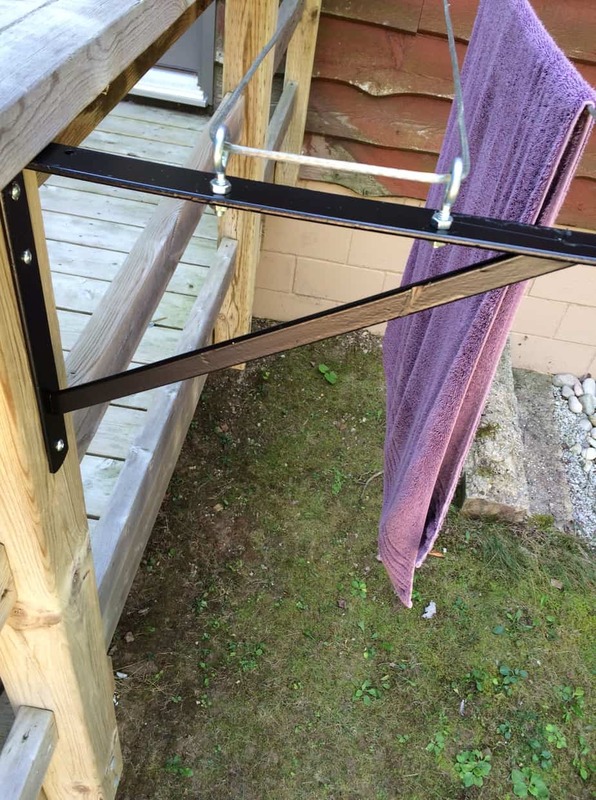 Have you made a handy laundry solution at your cottage or tried this one? Let us know in the comments!